In the 2018 National Defense Strategy, Defense Secretary James Mattis put “great power competition” at the center of the U.S. defense posture. But what will this “competition” look like, and what role will special operations play? Developing a conceptual understanding of what “competition” means for the 21st century demands a wide-ranging discussion, but one important component of that is the role of SOF in great power politics. 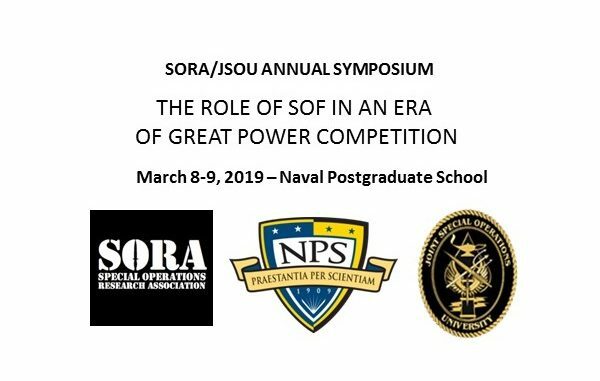 We hope to spur on discussion and reflection on both the concept of competition and the implications for SOF at this year’s annual symposium. We encourage submissions from a diverse population of those with expertise and interests in special operations, including academic researchers, military practitioners, and policy analysts. We are accepting individual paper and panel proposals and proposals for roundtables. Submissions will be accepted on a rolling basis, meaning we will try to get your paper accepted within 1-2 weeks of submission, if not sooner. More information is available at http://www.specopsjournal.org/symposium.html. Any questions? Please contact Christopher Marsh via email at editor@specopsjournal.org. The Special Operations Research Association (SORO) is a 501(c)3 non-profit that promotes research on special operations. SORO is co-sponsoring this symposium along with the Joint Special Operations University. The event will be hosted this year at the Naval Postgraduate School in Monterey, California. The above article was submitted by Christopher Marsh, President of SORO.